NOTE: The growth mechanism of SILVER WHISKERS is NOT believed to be analogous to Tin and Zinc Whisker formation. Nevertheless, whiskers formed on silver-coated contacts in a sulfur-rich environment pose a serious reliability hazard. 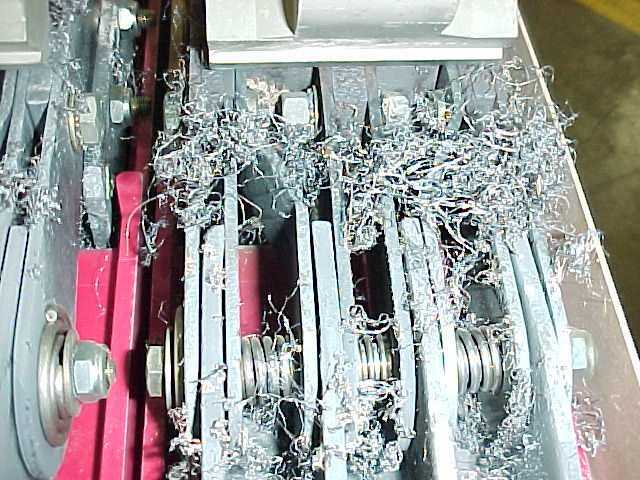 Expansive growth of silver whiskers has been found on primary current conductors of circuit breakers in switchgear at pulp recycling mill. The major environmental factor to initiate the growth is relatively low concentration of Hydrogen Sulfide (H2S). As soon as a thick enough layer of silver sulfide has been formed, metal filaments start to grow virtually everywhere but most intensely in locations usually having elevated temperature while electrical units are energized. Just in two months after previous cleaning, the whisker grows up to several inches (6-8 cm) long and up to 0.04 in (1 mm) thick. Most of the whiskers are made of silver with 1-3 % of copper. The surface of the whiskers long exposed to atmosphere is contaminated with silver sulfide. The growth eventually leads to catastrophic thermal failure.